Catref is a lovely little boat, benefitting from having much money spent on her in recent years , this is reflected in the very smart paint work on the exterior. At 31'Catref is an excellent first boat for weekends and holiday, she could also make a home for someone venturing out on their own. From the stern there is some seating which by night can be a single berth. Opposite is an off corridor bathroom with a cassette toilet and sink in a vanity unit. A board in the floor lifts out to provide a shower tray. Forward is a small galley with a Shoreline 12v fridge and a SMEV oven and hob.The saloon has seating either side which makes up into a double berth at night. 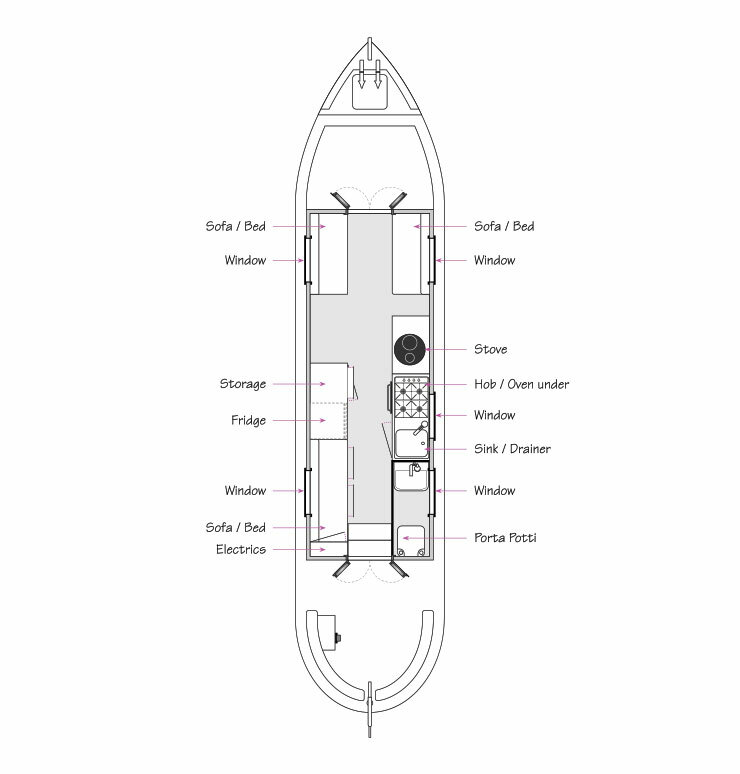 Between the saloon and the galley is a multi fuel stove. Notes: Forward saloon with seating either side which makes up into a double berth. A multi fuel stove sits between the galley and the saloon. Notes: Small galley with a 12v Shoreline fridge, SMEV oven and hob and instant water heater. Notes: Off corridor bathroom with cassette toilet, sink in vanity unit. A board removes from the floor to provide a shower tray.